(Español abajo) The conflict is related to the state-owned, Tel Aviv-based Mekorot Israeli National Water Company. In collaboration with the state of Israel, Mekorot, since its foundation in 1937, has restricted water supplies to Palestinian communities in order to supply Israeli settlers in what has been condemned as a water apartheid. Palestinians are charged higher rates for water than Israelis, even though much of this water comes from Palestinian territories. Furthermore, Mekorot has facilitated the illegal Israeli settlements by building water infrastructures that are essential to their development. The company is also accused of committing the international crime of pillaging natural resources in the occupied territories. The breach of the right to water violates Article 1 of the International Covenant on Economic, Social and Cultural Rights, as well as several other human rights, such as the rights to health, adequate housing and food, to which water is essential, thus also violating the International Covenant on Civil and Political Rights (ICCPR), the International Convention on the Elimination of All Forms of Racial Discrimination, the UN Convention on the Rights of the Child (CRC) and the 64/292 UN GA Resolution recognizing the right to water and sanitation. Moreover, since Israel is an occupying power in the West Bank, the Gaza Strip and Jerusalem, the foregoing can also entail a crime of persecution and forced displacement, in breach of the IV Geneva Convention and the Statute of the International Criminal Court. History of the conflict Mekorot has been Israel’s national water company since 1937, operating through its three subsidiaries (Mekorot Water, Mekorot Infrastructure and Mekorot Projects), which control all the water-related processes within the territory, from the water distribution and sales to the provision of the company’s expertise abroad. Mekorot both profits from and facilitates many of the human rights violations that are perpetrated over the Palestinian population. Mekorot’s activities have resulted in a highly unequal system of water management that further reinforce the different living standard between Israelis and Palestinians. For instance, Israel extracts every year an average of 461 MCM of water from the Mountain Aquifer underneath the West Bank. Palestinians on the other hand extract only on average 100 MCM a year from this same resource, with Mekorot supplying 75 MCM and 45 MCM coming directly from wells within the West Bank controlled by Israel or by settlers. This results in the daily water consumption per person in the OPT being 70 litres – well below the 100 litres per capita daily recommended by the World Health Organization (WHO) – while Israeli daily per capita consumption is about 300 litres. Furthermore, the monopoly ran by Mekorot over the water infrastructure of Gaza and the West Bank (which was handed over to the company after the 1982 occupation for 1 NIS [1 NIS = .23€]) not only prevents Palestinians of accessing their own water, but also of denies their entitlement to a market source from which Mekorot now profits and hinders the agricultural potential of the population. The responsibility of Israel comes from the almost totality of the public contracts that runs with the company as well as from its promotion around the world, utilizing its bilateral ties with other countries to export the expertise obtained through the aforementioned violations. The role of the Architecture of Impunity The impunity of Mekorot is inevitably linked to the political development of the State of Israel and the international support it still maintains. The current status of the water legislation is still determined by Article 40 of the Oslo II accords (1995), witnessed by representatives of the US, Russia, Egypt, Norway and the EU. The accords were originally intended to recognize undefined Palestinian water rights. However, they imposed severe restrictions on the development and maintenance of Palestinian water infra-structure and formalized an asymmetric Joint Water Committee (JWC) that, from the beginning, allocated a much greater portion of the aquifers to Israel. The World Bank issued, in 2009, an assessment of the results of the Oslo II accords, which, although initially expected to be revised after 5 years of its signing, were and are still in force. The report indeed proved that the new system not only did not reach the expectations (with half of the households claiming problems in the quality of the water and only 31% of the West Bank inhabitants connected to a sewerage network), but also water withdrawal per person has declined since then and the percentage of household income des-tined to water doubles the globally accepted standard. While the overall supply has increased, there is a greater (enforced) reliance on Mekorot. Proof of the difficulties of the Palestinians to develop their own water industry is the fact that the JWC has rejected most Palestinian-proposed projects, while all but one of the projects proposed by Israelis have been approved. What is worse is that, despite Oslo II enhancing an already unequal system, Mekorot has continued to even break the minimum requirements of the article. The fact that the water provisions stated at Oslo II have not been revised in 20 years portrays the little importance that international actors have given to the situation. Even the World Bank, despite the finding of the aforementioned report, is the main sponsor of the Red-Dead Sea Canal project, an agreement between Israel, Jordan and the Palestinian Authority (although the President of the Palestinian Water Authority claims the agreement was essentially between the first two). The great majority of Palestinian NGOs requested a stop to all forms of cooperation and a public rejection to the project, as it continues to legitimize the water rights dispossession taking place in Pales-tine. The World Bank Inspection Panel that investigated the impact of the project for Palestinians considered the arguments of the resistance as legitimate, yet refused to act. Furthermore, a number of individual states have received “exported expertise” from Mekorot: Argentina, Australia, Azerbaijan, Brazil, Bosnia, Canada, Cyprus, Greece, India, Malta, Mexico, Serbia, South Korea, United Kingdom and United States. Mekorot has also benefited from the EU-Israel Association Agreement, which provides Israel with preferential trade terms with the 27 EU countries. Particularly relevant is the EUR 120 million contract from the European Investment Bank which will be destined to a Mekorot subsidiary for the construction of a seawater desalination plant. Attempts of access to justice Aside from the well developed resistance to the occupation of the Palestinian territory, there has also been an organized strategy to oppose the activities of Mekorot in what relates to the water rights violations. As there is no possibility for a short or midterm remedy by the government of Israel, the affected community has had to look for the support of the international community to bring justice to their land. The campaign Stop Mekorot has thus designed a careful strategy of resistance, structured in four levels: community mobilizing; public advocacy; boycott, divestment and sanction campaigns; and lobbying and legal advocacy. Some of their actions have received international response. For instance, the Secretary-General of the UN included in his report to the 25th session of the Human Rights Council a condemnation of Mekorot’s policies. The United Nations report of the independent international fact-finding mission on the implications of the Israeli settlements on the rights of the Palestinian people also condemned Mekorot. Furthermore, a French parliamentary report referred to these policies as water apartheid. The First International Week Against Mekorot was organized between March 22-30, 2014, with mobilizations taking place all around the world. Three major victories have come as the result of pressuring companies or countries not to do business with Mekorot. At the end of 2013, after a three-year long campaign, Argentinian activists succeeded in stopping a 170 million contract that would have had Mekorot build a water treatment plant in La Plata (Buenos Aires); again, at the end of 2013, the Dutch public water company Vitens cancelled a Memorandum of Understanding with Mekorot because cooperation with company “cannot be separated from what the UN writes about the policy of Mekorot […] towards the Palestinian territories and the settlements”; and in March 2014, the public water company EPAL in Lisbon (Portugal) announced that, after a high level campaign, it had ended a cooperation agreement with Mekorot before its expiry term. What Justice could do: a say from the PPT In a hearing that was held in Geneva in June 2014, the Permanent People’s Tribunal (PPT) listened to the testimony of Abeer Al Butmeh, from Stop the Wall / Pengon. Considering the evidence brought before the judges by this witness, the Tribunal recognized the actions of the transnational corporation as another example of violations of human and people rights. In line with its full judgement of Madrid, in May 2010, and just a few months before the session that was held in Mexico in December 2014, the PPT underlined once again how transnational corporations, including Mekorot, systematically violate human and peoples’ rights to their own profit. In the same line, the PPT recognized in this widespread practice the current shortcoming of international law, namely the impossibility of accessing justice and obtaining a remedy that is increasingly becoming an unbearable burden for affected communities, as well as for the laws that are supposed to give them shelter. In the same spirit, the PPT acknowledged the necessity to improve international legislation, including through a binding treaty on transnational corporations, and a Peoples’ treaty, in order to hold transnational corporations accountable for their actions. Español Resumen del conflicto El conflicto está relacionado con la compañía nacional de agua de Israel, Mekorot. En colaboración con el Estado de Israel, Mekorot, desde su fundación en 1937, ha restringido el suministro de agua a las comunidades palestinas en beneficio de los colonos israelíes en lo que se ha considerado como un apartheid de agua. Los palestinos deben pagar tarifas más elevadas que los israelíes, a pesar de que la mayoría del agua proviene de territorios palestinos. Es más, Mekorot facilita la expansión y subsistencia de los asentamientos de Israel al construir una red de distribución del agua e infraestructura esencial para su desarrollo. La compañía también es acusada del crimen internacional de saqueo de recursos naturales en los territorios ocupados. La violación del derecho al agua quebranta el Artículo 11(1) del Pacto Internacional de Derecho Económico, Sociales, y Culturales, así como de muchos otros derechos humanos para los que la provisión del agua es fundamental, como el derecho a la salud, la vivienda, y a la comida. Esto supone, por tanto, una violación del Pacto Internacional de Derechos Civiles y Políticos, de la Convención Internacional sobre la Eliminación de Todas las Formas de Discriminación Racial, del Convenio de Naciones Unidas sobre los Derechos del Niño, y de la Resolución 64/292 de la Asamblea General de Naciones Unidas sobre derecho al agua y sanitarios. Por último, al ser Israel una potencia ocupante en Cisjordania, la franja de Gaza y Jerusalén, lo anterior también podría constituir un crimen de persecución y desplazamiento forzado, en violación de la Convención de Ginebra IV y del Estatuto de la Corte Penal Internacional. Historia del conflicto Mekorot ha sido la compañía nacional de agua de Israel desde 1937, operando a través de tres subsidiarias (Mekorot Water, Mekorot Infrastructure y Mekorot Projects), que controlan todos los procesos relacionados con el agua en el territorio, desde la distribución del agua y su venta a la exportación de tecnología. Mekorot se beneficia de y facilita las violaciones de derechos humanos perpetradas contra la población palestina. Las actividades de la compañía han implantado un sistema de gestión del agua altamente desigual, aumentando la diferencia en los niveles de vida entre israelíes y palestinos. Por ejemplo, Israel extrae cada año una media de 461 Mm3 de agua del Acuífero de la Montaña, en Cisjordania. Los palestinos, sin embargo, solo extraen una media de 100 Mm3 al año de la misma fuente, siendo 75 Mm3 de éstos suministrados por Mekorot y 45 Mm3 proveniente de pozos situados en Cisjordania controlados por israelíes o colonos. Esto produce que el consumo de agua medio por persona en los territorios ocupados sea de 70 litros – muy por debajo de los 100 litros por persona diarios recomendados por la Organización Mundial de la Salud (OMS) – mientras que el consumo diario medio para un israelí alcanza los 300 litros. Además, el monopolio de Mekorot sobre el agua de Gaza y Cisjordania (el cual fue entregado a la compañía tras la ocupación de 1982 por 1 NIS [1 NIS = 0,23€]) no solo impide a los palestinos el acceso a su propio agua, sino que también les niega su derecho a una fuente de mercado de la que Mekorot extrae los beneficios y obstruye el desarrollo de la agricultura en la zona. La responsabilidad sobre Israel proviene tanto de la casi totalidad de contratos públicos que mantiene con la compañía como de la promoción de ésta fuera de sus fronteras, utilizando sus contactos bilaterales con otros países para exportar el conocimiento obtenido a través de las anteriores violaciones. El papel de la Arquitectura de la Impunidad La impunidad de Mekorot está inevitablemente relacionada con el desarrollo político del Estado de Israel y el apoyo internacional que todavía mantiene. El actual estado de la legislación sobre el agua sigue determinado por el Artículo 40 de los Acuerdos de Oslo II (1995), firmados en presencia de representantes de EE.UU., Rusia, Egipto, Noruega y la U.E. Uno de los propósitos originales de los acuerdos era reconocer los derechos del agua no definidos de los palestinos. Sin embargo, acabaron imponiendo serias restricciones en el desarrollo y mantenimiento de la infraestructura del agua en Palestina y formalizaron un Comité Conjunto del Agua (JWC, en sus cifras en inglés) asimétrico que, desde el comienzo, asignó una porción mucho mayor de los acuíferos a Israel. El Banco Mundial publicó en 2009 una evaluación de los resultados de Oslo II, los cuales, a pesar de la intención inicial de revisarlos tras 5 años, seguían (y siguen) aún vigentes. El informe, en efecto, comprobó que el nuevo sistema no solo no alcanzó las expectativas (con la mitad de las viviendas alegando problemas en la calidad del agua y con solo un 31 % de los habitantes de Cisjordania conectados a un sistema de alcantarillado), sino que además la extracción de agua por persona ha descendido desde entonces y el porcentaje de ingresos por hogar destinado al agua dobla el estándar globalmente aceptado. A pesar de que el suministro total ha aumentado, hay una mayor dependencia (obligada) de Mekorot. Prueba de las dificultados impuestas sobre los palestinos a la hora de desarrollar su propia industria del agua es el hecho de que el JWC ha rechazado la mayoría de proyectos propuestos desde Palestina, mientras todos menos uno de los proyectos propuestos por israelíes has sido aprobados. El aspecto más negativo es que, a pesar de que Oslo II reforzara una desigualdad ya latente, la compañía israelí todavía trata de rebajar aún más los mínimos establecidos en los acuerdos. El hecho de que las condiciones respecto al agua establecidas en Oslo II no hayan sido revisadas en 20 años retrata la poca importancia que los actores internacionales han dado a la situación. Incluso el Banco Mundial, que publicó el ya mencionado informe, es el principal promotor del proyecto para el Canal del Mar Rojo – Mar Muerto, un acuerdo entre Israel, Jordania y la Autoridad Palestina (aunque el presidente de la Autoridad del Agua Palestina alega que el acuerda se llevó a cabo principalmente entre los dos primeros ). La gran mayoría de las ONGs palestinas demandaron el cese de todas las formas de cooperación y un rechazo público al proyecto, pues continúa legitimando la desposesión de los derechos del agua llevada a cabo en Palestina. El Panel de Inspección del Banco Mundial que investigó el impacto del proyecto en las poblaciones palestinas consideró legítimos los argumentos de la resistencia, pero decidió no actuar. Finalmente, varios países han recibido consultoría y conocimientos de Mekorot: Argentina, Australia, Azerbaiyán, Brasil, Bosnia, Canadá, Chipre, Grecia, India, Malta, México, Serbia, Corea del Sur, Reino Unido y los Estados Unidos. Mekorot también se ha beneficiado del Acuerdo de Asociación UE-Israel, que provee de condiciones de negocio preferentes a Israel con 27 miembros de la UE. Merece especial mención el contrato de 120 millones de euros firmado entre el Banco Europeo de Inversiones y una subsidiaria de Mekorot para la construcción de una planta desalinizadora. Intentos de acceso a la justicia Además de la ya desarrollada resistencia a la ocupación del territorio palestino, también ha habido una estrategia organizada para impedir las violaciones de los derechos del agua de Mekorot. Puesto que no existe prácticamente ninguna posibilidad de remedio a corto o medio plazo desde el gobierno de Israel, las comunidades afectadas han tenido que buscar el apoyo de la comunidad internacional para conseguir el acceso a la justicia. La campaña Stop Mekorot ha diseñado una cuidadosa estrategia de resistencia, estructurada en cuatro niveles: movilización de la comunidad; incidencia política pública (public advocacy); campañas de boicot, desinversión y sanciones; y lobbying e incidencia legal (legal advocacy). Algunas de estas acciones han recibido una notable respuesta internacional. Por ejemplo, el Secretario General de la ONU incluyó en su informe de la 25ª sesión del Consejo de Derechos Humanos una condena de las políticas de Mekorot. El informe de la misión independiente de la ONU para las implicaciones de los asentamientos israelíes sobre los derechos del pueblo palestino también retrató las actividades de la compañía. Una publicación del Parlamento francés llegó a referirse a estas políticas como “apartheid del agua”. La Primera Semana Internacional Contra Mekorot fue organizada entre los días 22 y 30 de Marzo de 2014, con movilizaciones por todo el mundo. Las presiones hacia compañías y países para que no se involucrasen en negocios con Mekorot dieron como resultado tres victorias destacables. A finales de 2013, tras tres años de campaña, activistas argentinos consiguieron detener un contrato de 170 millones que habría dado la posibilidad a Mekorot de construir una planta de tratamiento de agua en La Plata (Buenos Aires); de nuevo, a finales de 2013, la compañía pública holandesa Vitens canceló un Memorándum de Entendimiento con Mekorot debido a que la cooperación con la compañía “no puede ser separada de lo que la ONU escribe acerca de las políticas de Mekorot […] en los territorios palestinos y los asentamientos”; y en Marzo de 2014, la también compañía pública EPAL en Lisboa (Portugal) anunció que, tras una campaña de alto nivel, terminaba su acuerdo de cooperación con Mekorot antes de finalizar su periodo de vigencia. Lo que la justicia podría hacer: una opinión del TPP En la sesión en Ginebra de junio, 2014, el Tribunal Permanente de los Pueblos (TPP) escuchó el testimonio de Abeer Al Butmeh, Stop the Wall / Pengon. Considerando lo expuesto ante los jueces del tribunal, éste reconoció las acciones de la corporación transnacional como otro ejemplo de violaciones de derechos humanos y de los pueblos. De acuerdo a la sentencia de Madrid, en mayo de 2010, y unos meses antes de la sesión que tuvo lugar en México en Diciembre 2014, el TPP resaltó de nuevo cómo las corporaciones transnacionales, incluida Mekorot, violan sistemáticamente estos derechos para su propio beneficio. El tribunal reconoció en esta extendida práctica la evidente limitación del derecho internacional. La imposibilidad del acceso a la justicia y a obtener remediación está convirtiéndose en una carga cada vez mayor para las comunidades afectadas, así como las leyes que deberían protegerlas. Así mismo, el TPP reconoció la necesidad de mejorar la legislación internacional, incluyendo un tratado vinculante para las corporaciones transnacionales y un Tratado de los Pueblos, para que así estas empresas sean consecuentes con sus acciones. Project Details Israel extracts on an annual basis an average of 461 MCM of water from the Mountain Aquifer underneath the West Bank, which is fully controlled by Israel. Palestinians on the other hand extract only on average 100 MCM a year from this same resource, because Israel actively denies Palestinians access to the aquifer. Israel extrae anualmente una media de 461 Mm3 de agua del Acuífero de la Montaña bajo Cisjordania, el cual está totalmente controlado por Israel. Los palestinos, por otro lado, extraen tan solo una media de 100 Mm3 al año de la misma fuente, puesto que Israel activamente les deniega el acceso al acuífero. Level of Investment (in USD) The company’s annual income is about $1.14 billion, its equity is about $992 million (not including a company in formation) and annual balance sheet (consolidated report) of about $4.17 billion. 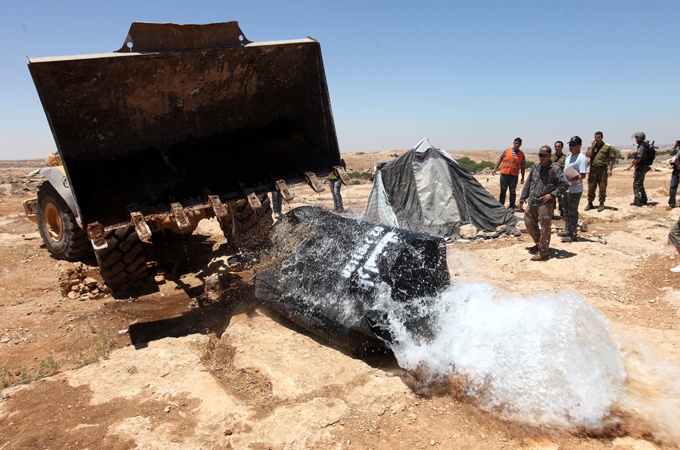 Other By depriving Palestinian communities from the possibility of access to water, consumption in the OPT is about 70 litres a day per person – well below the 100 litres per capi-ta daily recommended by the World Health Organization (WHO) – whereas Israeli daily per capita consumption, at about 300 litres, is about four times as much. Furthermore, by supporting and enabling the Israeli occupation settlements, Mekorot is also an indirect agent of the many health impacts resulting from the living situation in these territories, which could include all of the above. Al privar a las comunidades palestinas de posibilidades de acceso al agua, el consumo de agua medio por persona en los territorios ocupados es de 70 litros – muy por debajo de los 100 litros por persona diarios recomendados por la Organización Mundial de la Salud (OMS) – mientras que el consumo diario medio para un israelí alcanza los 300 litros. Además, al aprovecharse de y facilitar los asentamientos israelís, Mekorot es también agente indirecto de los muchos impactos sobre la salud resultantes de la situación de vida en estos territorios, los cuales podrían incluir todos los arriba mencionados.